Earlier this week, we caught beef tenderloins on sale for $10.99 a pound, so we snatched one up. When you butcher a whole beef tenderloin into filet mignon steaks, there are parts of the tenderloin left (the trimmings) that aren’t big enough to serve as steaks, but you don’t dare waste that wonderfully tender meat. I froze some of the trimmings for a future pot of Beef Bourguignon and with four of the smallest “steaks” I decided to make Grillades and Grits. 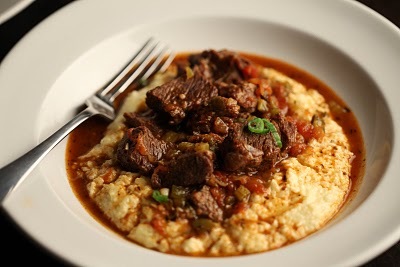 Grillades and grits is a southern (New Orleans mostly) tradition served usually at brunch but it can make an excellent dinner. The meat “grillades” can be anything and many times you see them made from round steak, chuck roast, pork tenderloin medallions and at times, beef tenderloin. I knew the basics for making this dish, so I drew on my Southern roots and Creole heritage (no, I’m not Creole, but my father’s family came to Birmingham from New Orleans and picked up all the cooking techniques) and created a really good version of this classic dish. It was so good, I had to run write it down, so I thought I’d share it with you. First, I made the grits. I used 5 minute “quick cook grits” (Jim Dandy). The amount you use will depend on how many servings you want to yield. Follow the instructions on the box or bag except where it says to start with boiling water, replace the water with chicken or vegetable stock (I used vegetable stock made from “better than bouillon” stock base). To the stock, add 1/4 cup heavy cream, 1 tbsp garlic powder and 1 tbsp Italian seasoning. Once the grits are cooked, fold in 1/2 cup shredded Parmesan cheese. In a large saute pan, heat the olive oil, then add the meat and sear on all sides to get a nice caramelization and cook to medium or medium rare (about 3 minutes per side). Remove the meat and hold in a bowl. To the pan drippings, add the onion, bell pepper and mushroom and cook until the onions and bell pepper are tender. Deglaze the pan with the liquor/wine, scraping up all the burnt bits on the bottom of the pan (that’s your sauce flavor). Add the cream, mustard, salt, pepper and garlic powder and boil until the sauce begins to thicken. Add the meat back to the pan. To serve, mound some of your cheese grits on a plate. Top with 2 pieces of meat and then a spoonful of the sauce over the meat. This entry was posted in Entree and tagged beef tenderloin, cheese grits, cream, filet mignon, grits, liqueur, mushroom, parmesan, vegetable stock, wine by quarlj01. Bookmark the permalink.